The Autumn Republic concludes the Powder Mage trilogy with, if you’ll pardon what in this case is a fairly terrible pun, a bang. This trilogy is the first finished major series* in the new flintlock fantasy genre. If you just want a quick verdict on the trilogy- it’s pretty good. Not perfect, but definitely good, and shows definite signs that Brian McClellan is going to have a very interesting writing career ahead of him. 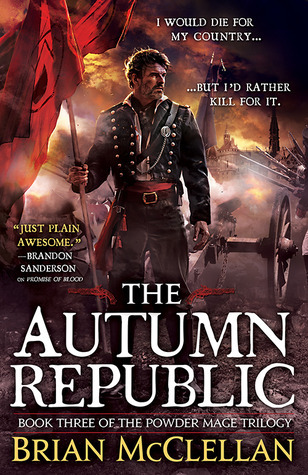 The Autumn Republic has clear prose, fast paced and well constructed action scenes, sympathetic characters, and interesting worldbuilding. Really quick, let’s get the complaints out of the way, of which I only really have a couple. Some of the foreshadowing in the books could have been handled better. There were several instances of it in the previous books that led me to believe certain subplots would materialize here in the finale that simply never occurred. While there was resolution to them, it did not take the path the books seemed to indicate they would. That can partially be chalked up to the author deciding to take a different path with the book- which he did a fine job of. There aren’t any internal inconsistencies presented by the change of course, just a little minor cognitive dissonance- really cognitive indigestion- it caused me. A lot of it was likely caused by some of the theories about what was going to happen that I built up in my own head. Overall, not a big deal. Though I can go on for quite a while when complaining about something, there was a lot more to like than dislike. The titular gunpowder mages are very enjoyable to follow. Many magic systems rely on sheer, absurd power levels to make action scenes interesting. Don’t get me wrong, I like flying archmages hurling lightning, fire, and monstrous curses at each other as much as the next guy, and there is a good bit of that in these books with the Privileged, but the powder mage’s much more subdued powers make for damn good reading. They get increased strength, speed, and senses from eating or snorting gunpowder, they can guide bullets or shoot them farther, they can detonate gunpowder at range, and they can subdue or control gunpowder explosions to a small extent. They’re still powerful and dangerous, but there is much more of a sense of personal danger involved when they’re in battle- they might be tougher than normal, but they can still be killed by bullet or blade, there is a definite danger of addiction to gunpowder, and yet they can actually take on the much more powerful Privileged, at least if they have the element of surprise or planning on their behalf. There’s a much greater level of tension involved while following the powder mages than other magic users in fantasy. The worldbuilding is decent, especially when it comes to the main country, Adro, and more specifically the capitol Adopest- it really feels like a fleshed out, real place to live. Outside of Adro, the other countries do feel a bit unfleshed, but since the overwhelming majority of the action occurs in Adro and Adopest, that’s pretty forgivable. The POV characters are one of the book’s strongest points- they’re all compelling, flawed, and have strong voices of their own. I’ve got to reinforce the flawed bits- unlike so many characters in so many books by new authors, whose flaws only exist to keep them from being Mary Sue characters, the POV characters here are often actually hurt or set back by their flaws, and have to really struggle against them, which make for some of the best scenes in the book. Even the minor characters feel well fleshed out, and almost none of them feel like cut and pasted tropes- even characters who appear for just a few pages in a single scene have distinct personalities, traits, and quirks of their own. Overall, it’s definitely a fun read, and is further proof of the increasing breadth of the fantasy genre, which for much too long was dominated by a very small array of plots, settings, and characters, very often drawn almost directly from Tolkien. The Powder Mage trilogy delivers exactly on what it promises. While I agree it was a good final book in a good series, I feel that the female characters, particularly Ka’Poel (who just didn’t get enough character development and characterisation) and Vlora (who spent the whole series playing catchup for her very negative intro, which wasn’t helped by her later relationship) were really not given the time or effort they deserved. I read all the novellas as well as the trilogy and I really wanted to like Vlora, but even at the end I was struggling to identify with her, mostly because there was nothing to really humanise her. Of course the missing book of the series doesn’t help in that, where is the story of the Fatrastan rebellion? I actually liked Vlora more than Ka’Poel, but I can definitely see where you’re coming from.